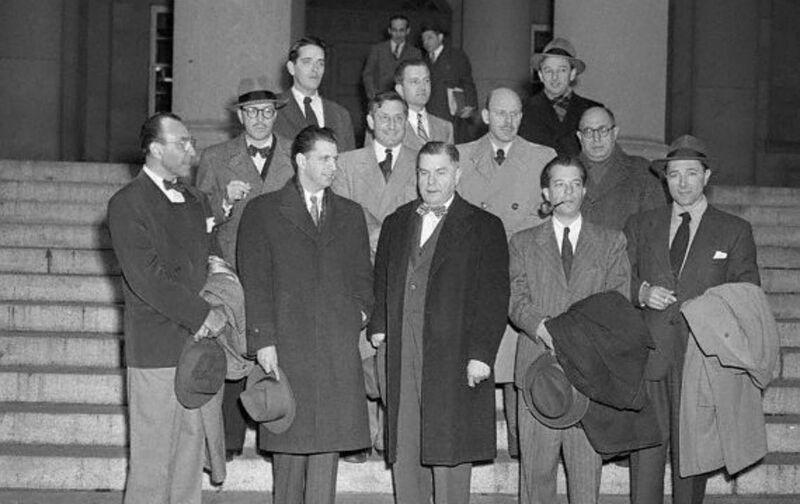 Terms like “McCarthyism” and “McCarthy era” have long been misnomers, as the crackdown on dissent in America began long before McCarthy himself sought to lead it. Those dark days began in earnest with President Truman’s imposition of a loyalty oath requirement for all federal employees. “Hays code” refers to the film industry’s self-imposed censorship, which reigned from 1930 to 1968. The Un-American hearings directed by [New Jersey Representative] J. Parnell Thomas and designed to expose Communist plots in Hollywood are still going strong in Washington…. The first episodes of the Perils of Parnell, though they have played to a full House, have been a dismal flop as far as their alleged purpose is concerned. The Undoubting Thomas and his committee have added little to what was already known about Hollywood—that there are actors and writers among the swimming pools who, with varying degrees of innocence, salt their high-paid existence with dreams of “the revolution” and even sometimes invest some of their money in it. But the committee has done a fine job of flouting every American precept of the rights of individuals and doing it in the most cowardly way possible—under the protection of its Congressional immunity. Moreover, by holding over Hollywood the threat of such “investigations,” it has added to the stultifying pressure of the Hays code [The Motion Picture Production Code, a set of “moral” requirements for all American films] still another pressure which should go far toward making American films even more puerile and timid than they already are. We doubt whether the hearings are a prelude to censorship, if only because such exhibitions make official censorship unnecessary. Altogether, a fine day’s work—making hash of the Bill of Rights at the American taxpayer’s expense. The exposure of a few Communists in Hollywood seems hardly worth the price.